A controversial article by Jacques Steinberg, a writer for NYTimes.com, may have caused short-term damage to the reputation of a large lead generation website, Classesandcareers.com; but yielded, unintentional, long-term revenue for their company. 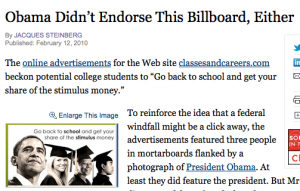 In an attempt to vilify them the NYTimes.com called out Classesandcareers.com for using President Barack Obama’s image in an online advertisement. In Jacques Steinberg’s attempt to paint the website in a bad light, she/he also provided a valuable link to Classesandcareers.com. If you have a mind for online marketing, or are a Search Engine Optimizer (SEO), you already know a link from NYTimes.com is valuable. The NYTime.com is one of the most popular websites on the Internet; this is largely due to the numerous reputable links pointing towards it. In SEO terms we like to call this “link juice”. There is so much link juice flowing into the NYtimes.com that webmasters around the globe have targeted it as a place to get their website mentioned and linked to. Inadvertently, Classesandcareers.com has successfully done this. How Do Inbound Links Effect Marketing and Conversion Rates? Google uses a scale of popularity called “Domain Authority” for every website or “domain” on the Internet, ranging from 0-100. A brand new site with no links and no content would have a domain authority of (0) while sites like Google.com and NYTimes.com would have a domain authority of 100. This and many other factors play into where a page on your website will show up in Google’s search engine rankings. If a website like Classesandcareers.com has a domain authority of, lets say 68, then a link from NYTimes.com could bump them up to a domain authority of 69. Each point of domain authority is exponentially harder to gain the higher up the scale your website goes. So it would take many more links for a site to move from a domain authority of 68-69 as it would for as it would for a site to move from 67-68. When the NYTimes.com linked to Classesandcareers.com they did so with the words “online” and “classes” (illustrated below) passing valuable link juice to Classesandcareers.com. 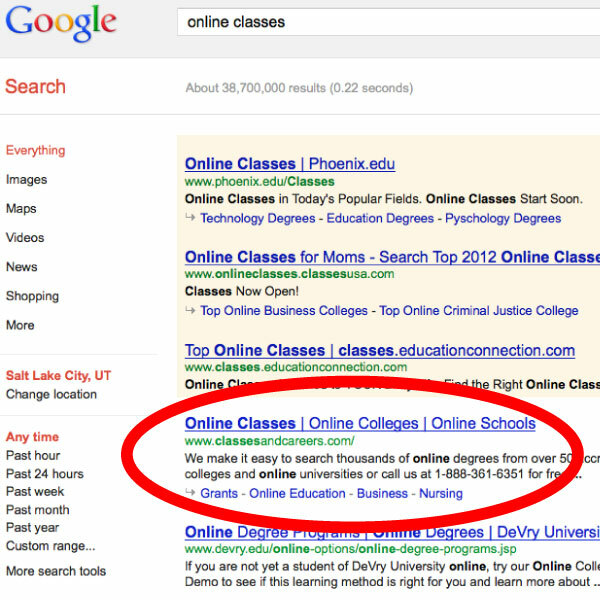 People who search the key phrase “online classes” in the Google search box are very likely to sign up for a class with an online university. In an attempt to paint Classesandcareers.com in a negative light NYTimes.com inadvertently helped them gain their number one spot in Google for the highly competitive key phrase “online classes”.